Plymouth State University Sites > Faculty & Staff > Faculty Profiles > Jayashree V Arasu, Ed.D. 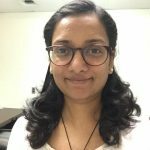 A proud alumnus of PSU, Professor Arasu earned her Doctorate in Education, with a specific focus on Education Leadership. She has more than a decade of experience working in the non-profit sector. Jayashree is formally trained in Computer Science Engineering, Career Psychology, and Philosophy of Education. Professor Arasu’s research interests are based around leveraging education to bring about sustainable community development. She is constantly finding ways to break boundaries of age, discipline, grades that compartmentalize learning and approach learning as a lifelong, integrated way of living. She is always happy to talk about community education philosophy, sustainability, school transformation, south Indian cooking, Indian Classical dancing, spirituality.